I’ve nearly finished the coffee pot, but whatever. I needed to get right to the weaving this morning. Here I have rotated it so you can get an idea of how it will look when it is hung. About two inches on the right will be turned to the back for a hem. So I am not along very far at all. 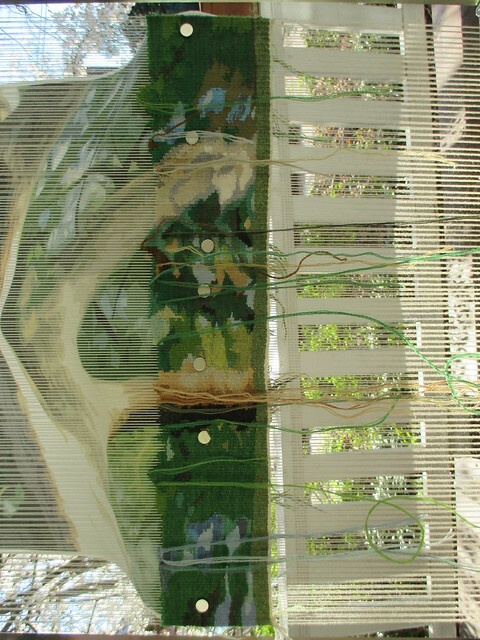 I will weave on the front porch in the natural light as long as the weather allows. 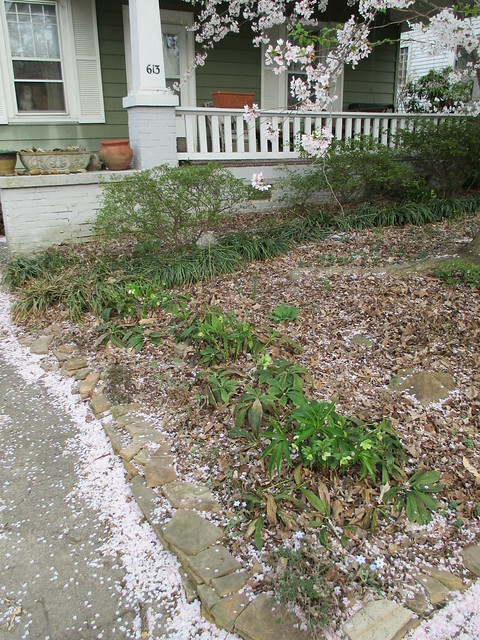 Right now there are cherry blossoms blowing all over the porch. It looks like snow. See Pablocito and Theo in the window? They have a turbulent friendship now. I have my new (two-year old model but new to me) little camera and a stick card reader for my (new to me) laptop so I am starting up my visual journal again. I will often do catch-up posts after I take the photos but whatever gets ‘er done these days is what I’m all about. I’m about to go out into the Back Forty to plant some lettuce, arugula, and turnip greens if I can find those seeds. The community garden will have to wait until I get my order from Pinetree Seeds and the plant sale at Greensboro Farmers Curb Market. I’m going to plant okra, tomatoes, and carrots there, and the okra and tomatoes need for the weather to get a little warmer. We also have green cotton seeds saved from last year, and flowers galore. I hope that we will get some volunteer flowers from last year, but an over-enthusiastic and well-meaning student cleaned up and prepped our plots for us. The woad is gone. In a way, I’m relieved, because I didn’t know what the hell to do with it anyway. I might need two claritin before the day is over – whoa. Because I am alone for lunch, I get to eat beets for lunch. Here’s a flashback to six years ago when I helped Mama plant her garden on Good Friday. She was 85 then. I miss our gardening conversations so much. Last year we planted tendergreens and carrots in her container garden. I’ll be thinking about her all day today as I plant.